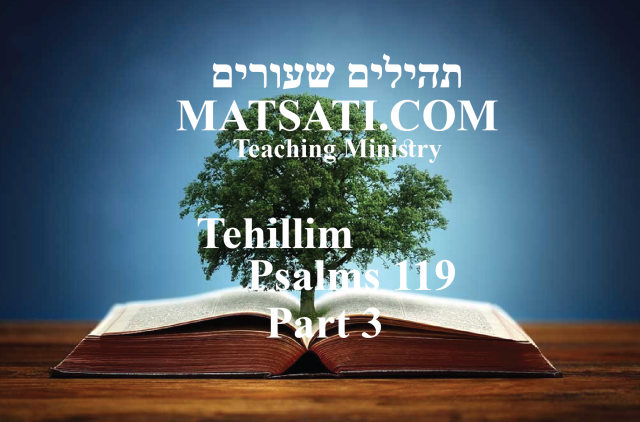 Tehillim / Psalms 119, ספר תהילים קיט, Part 3, Do We Believe in Something that is Contrary to Scripture? In this week’s study from Tehillim / Psalms 119:1-176, the Word (כִּדְבָרֶךָ) is used 23 times and is a reference to the spoken word of God to His people. This word is derived from the verb “to say” and has the nuance of of the promises of God for His people. The word Faithfulness (אֱמוּנָתֶךָ) is cited in Tehillim / Psalms as faithfulness (119:90), righteousness (119:40), and as name (119:132). Summarizing these terms in the Psalm speaks of God’s authority, faithfulness, and love for His people. The reference to these words are not as a suggestion to live but that obedience to the Lord is not optional for us as believers.